Like most properties sold by Alonzo Horton in the late 1860s, the lot on the southwest corner of Fifth Avenue and F Street changed hands early and often. The original owner, Frank M. Pixley, leased the lot to G.A. Jones, who then returned it to Pixley, who then sold it to D. Coates, who quickly sold it a month later to H.A. Waterman. Waterman promptly sold the south half of the lot to Arnold Schneider and Robert Grissom and erected a common wall between the two parcels. The north half of the lot was acquired in 1873 by Charles Delaval. Delaval is responsible for the construction of the brick building now known as the Spencer-Ogden Building, one of the oldest buildings in the Gaslamp Quarter. It is also the oldest structure to be continually owned by the same family. Delaval, a native of Pays de Calais, France, came to the U.S. in 1851. He traveled to Los Angeles, where he married and started a grocery store, which he ran for eight years. Delaval arrived in San Diego in 1870, where he partnered with H.A. Waterman to start a wholesale grocery store under the name of “Delaval and Waterman.” Delaval then started construction of the brick building, which was completed in 1874. William Lacey, the architect and a native of England, described the structural style as French Renaissance, but it is actually a mixture of several styles. However, French plate glass was used on the three openings to the structure, and were the largest plates in town at the time. John Hanlon was the building contractor; Bailey’s San Diego Iron Foundry did the ironwork, and the foundation and stonework were constructed by E. Cook using El Cajon granite. The walls, like several early structures throughout the Gaslamp, were designed to permit building additional stories at a later date. This building did have another story constructed over and around the original building later. The ornamentation and the decorative castings were the work of the San Diego Foundry and Machine Works and were described by the San Diego Union as “rich and elegant.” The designs were drawn by the architect Lacey. Shortly after construction of the building, the partners sold out their grocery business and started a liquor business at Fifth and E Street. Unfortunately, the liquor business did not prosper and Delaval went back to Los Angeles to pursue the liquor business there. Misfortune again struck Delaval and he suffered substantial losses due to a fire in his liquor warehouse. In 1880, the property on Fifth Avenue in San Diego was sold to Jean Baron to cover his losses. Delaval ultimately returned to San Diego in 1889 and purchased the San Bernardino Wine Company. In 1881, Jean Baron sold the property to William Ogden and James Spencer. William Ogden was the City Treasurer, and James Spencer was an attorney in the prominent law firm of Balcom and Company. He later became a partner. 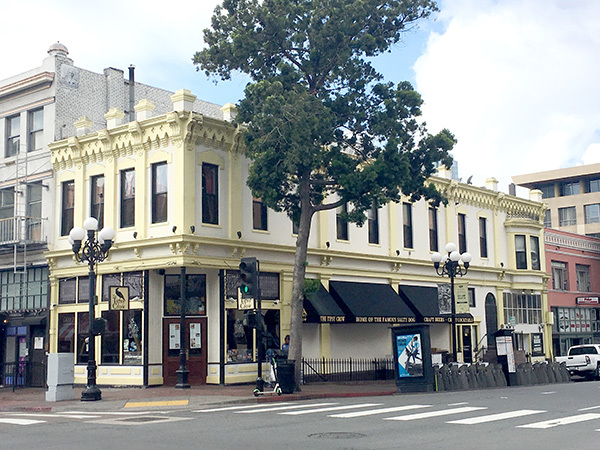 In 1885, Spencer and Ogden added a second story to the building, as well as a cement coat, which imitated blue granite. 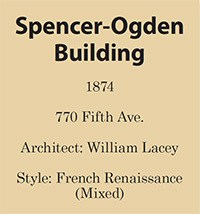 The Spencer-Ogden building was now three stories, including the basement. The first occupants, Reed, Daley and Gassen, who leased the entire structure, were realtors and title abstractors — a good business to be in during the land boom years of the 1880s! They later subleased the first floor to a succession of drugstores. The first drugstore to open at the Spencer-Ogden was Chase’s. They advertised that they could accommodate English, French, Spanish and Italian customers, thus reflecting San Diego’s growing multicultural population. Chase’s is best remembered for an explosion that occurred in June of 1887. A chemist who was making firecrackers accidentally spilled turpentine on sulphur, sparking a massive explosion and fire. After much confusion as to what would put out a chemical fire, the blaze was eventually extinguished with plain water. Chase’s was followed by Daggett’s, Hazelrigg Pharmacy, Hazelrigg and Robinson, Boehmer’s, and Robinson Drug Company. An early second floor tenant was an import business, owned by Burnell and Walz, which featured both Mexican and Indian curios. They billed themselves as a “tourist attraction.” Also, at this time, I. Levi operated a home furnishings emporium called the Golden Eagle Bazaar. Then, starting in 1904, a long line of dental offices occupied the building. The first was the Hutchason Dental Company, followed by E.P. Shepard, A.D. Cage and W.C. Grossman. One of the most well-known of the dentists had his offices at the Spencer-Ogden between 1910-1922. This gentleman had his first name legally changed to “Painless” so he could market himself as Painless Parker, without being charged with false advertising. In the 1920s, several tenants were listed as selling cigars or being “service clubs.” When the building underwent remodeling in 2010, the original basement walls revealed signage in an old German dialect that said, “A clever boozer already pockets his house keys in the morning.” Could it have been something else during Prohibition? Leading further credence to this theory are underground tunnels leading from the basement towards the waterfront. In the 1930s, the elaborate ironwork was removed from the roof and parapet due to earthquake ordinances, and later given to the government in the 1940s to be melted down for the war effort. — Sandee is the historian for the Gaslamp Quarter Historical Foundation. She can be reached at swilhoit@gaslampfoundation.org.